Marlene Greenebaum, who with her late husband, Stewart, made the founding gift for the University of Maryland Marlene and Stewart Greenebaum Comprehensive Cancer Center (UMGCCC), died Dec. 23, 2018, at the age of 80. A memorial service for Mrs. Greenebaum was held Dec. 26, 2018, at Temple Oheb Shalom in Baltimore. Her husband, a well-known real estate developer, philanthropist and civic leader, died Dec. 10, 2017. 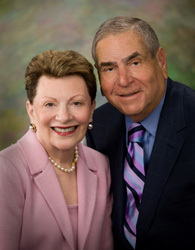 The cancer center was named for the Greenebaums after they gave $10 million to the center in 1996 after Mrs. Greenebaum’s successful treatment and recovery from breast cancer. They were longtime supporters of the University of Maryland Medical Center (UMMC), the University of Maryland Medical System (UMMS) and the University of Maryland School of Medicine (UMSOM). “All of us at the University of Maryland Medical Center mourn the passing of Marlene Greenebaum, who we treasure as a part of our UMMC family. She was the embodiment of grace and compassion along her own cancer journey and in how she supported others on theirs,” said Mohan Suntha, MD, MBA, president and chief executive officer of UMMC. “Her strong spirit and sense of purpose made the phrase ‘Where Hope is a Way of Life’ our mantra at the cancer center which bears hers and her beloved late husband’s names,” said Dr. Suntha, the Marlene and Stewart Greenebaum Professor of Radiation Oncology at UMSOM. Kevin J. Cullen, MD, director of the UMGCCC, called Mrs. Greenebaum “a dear friend and benefactor who turned her experience with cancer into a mission to help those who suffer from the disease here in Maryland and around the world." “With her husband, Stewart, as well as her children Michael and Amy, the Greenebaum family's support helped transform our cancer center which now helps thousands of cancer patients here in Maryland each year,” said Dr. Cullen, the Marlene and Stewart Greenebaum Distinguished Professor of Oncology at UMSOM. “The Marlene and Stewart Greenebaum Comprehensive Cancer Center has truly transformed the treatment of cancer around the world. “On a personal level, Marlene was humble and unassuming, but always ready to help our mission. A while ago, Marlene took the time to visit and distribute small gifts to our patients. It was easy to see how she connected with her fellow patients and how much they appreciated her presence and the impact of her support,” Dr. Cullen said. To make a gift to UMGCCC in memory of Marlene Greenbaum, please click here.